I'm having a performance problem in a site we've made, and I'm not exactly sure how to start diagnosing it. The short description is: We have a very small site (http://hearablog.com) with very little traffic, in a crappy dedicated server, CPU is always very high, sometimes it stays at 100% for minutes, and w3wp.exe is taking most of it. A typical scenario is w3wp.exe takes 60%, and SQL Server takes about 30%. Our DB is pretty small too. The site is hosted in a very crappy server by Cari.Net. From the beginning we had the feeling that the server didn't quite behave correctly, like some things would take just too long, so this could be a configuration problem from the get go. It may also be that we are getting a virtual server while we're supposed to have a dedicated one, although we have no evidence that'd indicate this, except for the fact that the server tends to be quite slow. The website is developed in ASP.Net MVC, using Entity Framework for data access. Now, this is pretty crappy hardware, but i've had other servers with these guys, with equivalent (or worse) HW, and performance is much better than this one. That said, the other servers have W2003 and SQL2005, and I'm using ASP.Net "WebForms" 2.0, no MVC, no LINQ, no EF; so I'm not sure whether going to 2008 / the other stuff means a big performance penalty is expected. I'm serving MP3 files (5-20 Mb) regularly, which is a slightly unusual load, maybe that is causing some kind of problems? Would that cause w3wp to use a lot of CPU? Disk usage seems very low. Memory is usually around 90%, but disk usage seems to indicate it's not paging much. I get tons of e-mails every day about SQL timeouts, for queries taking over 30 seconds, although all our queries are pretty straightforward (or should be, but EF may be screwing it up). 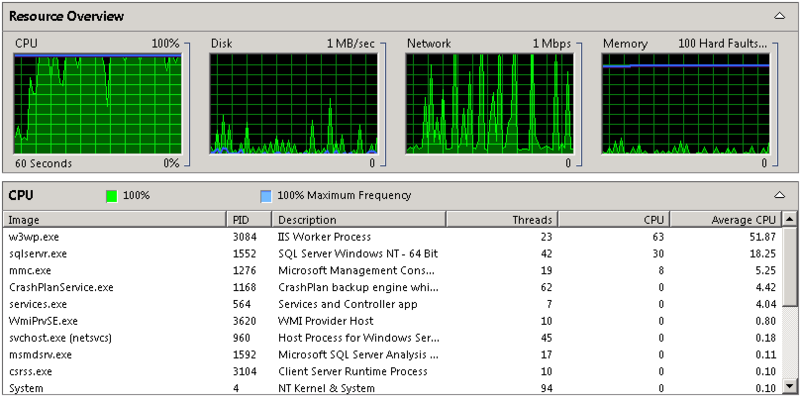 This is what resource monitor looks like in one of these "sprints" of 100% CPU, in case there's anything useful there. Is there any way of finding out "what" it is doing? Maybe even profile it? Any performance counters I should be looking at? Is this to be expected given this hardware/software configuration? Is this could be cause by some kind of configuration failure, where would you start looking? You can also use the Worker Processes UI inside IIS Manager and inspect the requests that are currently executing and see where they are getting stuck if any. Open IIS Manager->Click the Server in the Tree->Double Click Worker Processes Icon->Double click the Worker Process that is consuming CPU to see the currently executing requests in real time so that you can see which module is taking time. Also consider using Failed Request Tracing to track some of the time per request to see where they are taking long time. Ok, to start - the server is REALLY crappy. But it SHOULD be enough. For virtualization, check your drivers. I know of no virutalization platform that hides the CPU (and I coubt someone puts up a hyper-v or esx on a celeron) but the drivers for disc etc. are an indication. CPU should not be that high. Sadly, with this RAM, you are pretty much toast - if you start adding a profiler you pretty much will blow the memory you have. Check the logs for stuff executing at this moment. Upgrade the OS to 2008 R2 - a LOT more information is available there. In your dev environment make a copy of the site and run some performance tests. Use Failed REquest Tracking to find out which requests fail. has some start there. This may give you a hint in case the problems are more - hm - "categorizable". I would also keep longer term performance logs. Watch out for your IO (seconds / read, Seconds / write are pretty much the only relevant ones). All the rest is IO wise too vague - but once your IO starts taking longer than it should, the discs fall behind. I would rule out a configuration issue at this point - at least as primary indicator. Something uses up your W3p ressources, now you need to find out what it is. You could try using a program called Process Explorer to monitor individual threads running under the w3wp process. It should allow you to see what thread is causing all the damage. I had really great luck using Microsoft's Debug Diagnostic Tool to dump my w3wp process and then check out the threads and stack traces for things that were locking up. It'll even tell you the requested page that spawned the thread which is SUPER nice. I agree with TomTom down the line, especially about getting better mileage from a Virtual at this point. Debugging/profiling locally to narrow down the problem is the right thing to do. I am going to put on my Karnak The Magnificent hat and cape and ask for the first envelope. Ram Rebellion. What do you get when you put the OS, ASP.NET, and a greedy SQL Server Express into 1GB. I believe that your issue is that SQL Server Express is pulling in all available RAM for a Buffer Pool and being slow to release it. See http://support.microsoft.com/kb/321363 for more information. Also, IIS has a default cache of 256MB which you may need to tweak (https://stackoverflow.com/questions/2853135/controlling-asp-net-output-cache-memory-usage). Debug Diagnostics is a great tool for troubleshooting this (ok, probably a sledgehammer). http://technet.microsoft.com/en-us/library/bb742546.aspx is a pretty decent article to look at. http://social.technet.microsoft.com/forums/en-US/sharepointadmin/thread/706c653a-16b0-4696-85ee-9ae3552a582e points to app pool recycling gone mad as another possible issue. Use Perfmon's "Process" counter to see the individual attributes of the w3wp.exe process. How much of the CPU time for the worker process is kernel time? High kernel times could be indicative of paging, but you say you're not convinced. Other possibilities are duff drivers. The worker process has 23 threads active, which is good, but what are they doing? Try SysInternals' ProcessExplorer to dig around a bit more; you can also see what TCP/IP connections are in play. 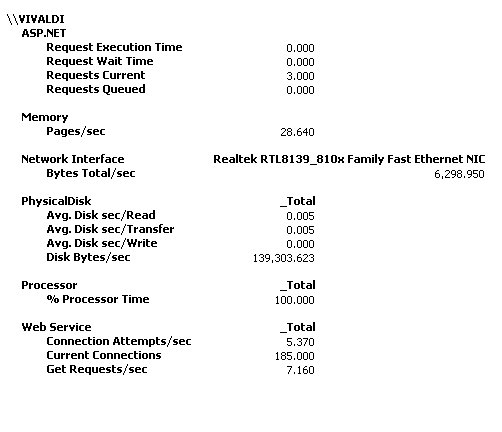 I haven't used SQL Express, but does it have memory tuning parameters, like its big brother. Is SQL starving IIS of memory, causing excessive paging? It might not be totally related, but verify if you are using NOLOCK in your queries. It might help in the case of the SQL timeouts. Not the answer you're looking for? Browse other questions tagged windows performance asp.net-mvc iis or ask your own question. Recommended Amazon AWS Setup for MVCv1 application?